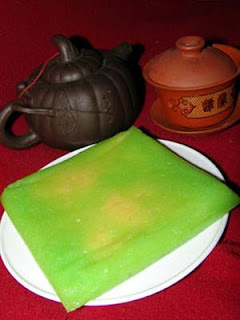 Green rice flake cake(Vietnamese meaning: bánh cốm) is one of the specialties of Hanoi bring national traditions line. Every mention green rice flake cake that people think of Hang Than street. The story is that, old Hang Than street only family of maternal great Nguyen Duy Quang’s house number 11 made green rice flake cake. When this cake is the normal goods, at night there are people carry baskets on the head to buy. Yet to date, professional make “hereditary” of family have 5 life. The first green rice flake cake no brand. Until 1920, when urban development, green rice flake cake has become familiar and bread to form a specialty of Hanoi should be named Nguyen Ninh. “Nguyen” means original, but “Ninh is Yen Ninh – the name of the mother’s village of boss. Cake have squares, packages by green banana leaf , external bind red bamboo string, label bring symbol 5 bats directed toward the single coin, which is meaning: Five blessings (wealth, position, longevity, good health, security). 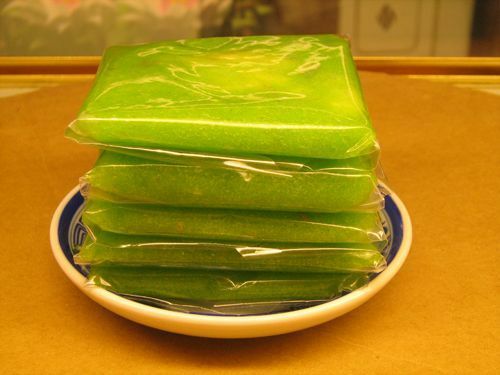 Time in period, people do green rice flake cake that think simply adapted the traditional as square glutinous rice cake, take it as fun and not think of it as it is now developing. Also sticky rice with green beans but with different flavors: salty cake. Thursday glutinous rice to green rice flake cake is a immature sticky rice processed form of green rice flakes, used as the crust. Stuffing including green beans and coconut. Both stuffing and crust are mixed with sugar, but while enjoying cake can not distinguish clearly better than anywhere. To make a delicious cake that selection raw material process must be very careful and rigorous. Green rice flakes is premature aging because when the sugar will dissolve, the crust was not used. 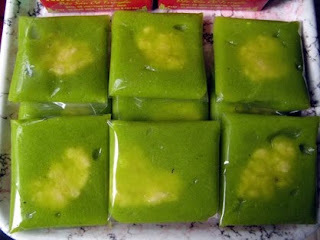 Usually every season green rice, people make cake mix a bit more fresh green rice to provoke cake is soft and perfumed. Then, green rice was kept hot in 1 hour and then brought fried sugar. Next is made of stuffing. Green bean was chosen as tasty bean in Thai Binh, Ha Bac, Son La, while others are not used much due to hatch when soaked in water more easily stale. Processing cake is also very important and meticulous no less than the selection of raw materials. The trick here is based entirely on experience and habit, not a specific formula. Fried nuggets are the most important stages. Technique here is fried just right, not too technical as the crust quickly too hard or not “soft” made green rice soft, easy flow, can not keep long time. Fry stuffing so, must wait patiently until the end of evaporation, leaving only sugar and bean stick together. Old days, green rice flake cake are done, scented grapefruit flavor flowers and some herbs. Grapefruit flower is used to store things picking flowers on the tree. This makes green rice flake cake has its own flavor, eat one is remembered. Along Hang Than Street has over 20 shops of green rice flake cake but with different akin names: An Ninh, Nguyen Ninh, Anh Ninh, Ninh Huong … Nguyen Ninh now is not unique anymore, but the secret of 5 life make green rice flake cake begin life has attracted the cross and whatever remains whether sales are specialties of Hanoi. Currently, the number of cakes made only a few hundred per day, mostly to order. But with this family, not to make green rice flake cake no business, which is continuing the tradition of ancestors. And silent work will forever save the sweet for life, scent of hundreds of years ago.